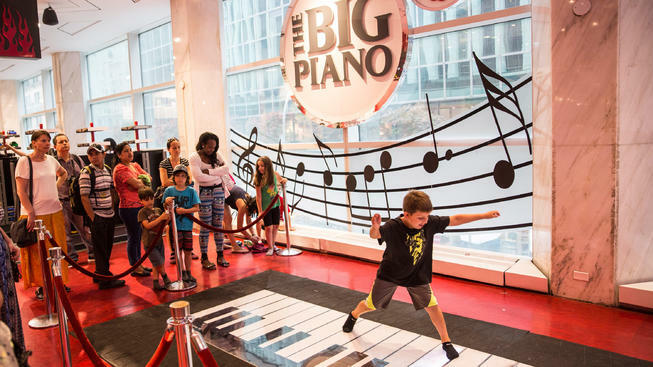 Three years after closing its beloved toy store on Fifth Avenue, FAO Schwarz has returned to New York City. A new FAO store opened last Friday in world famous Rockefeller Center. It is about 10 streets from its former home near Central Park. For more than 150 years, FAO Schwarz was known in New York for its high-class and sometimes high-priced toys. The Fifth Avenue store opened in 1986. But financial problems at the parent company and rising rents forced that store to close in 2015. Now, FAO Schwarz is pulling back from the worst financial crisis since it was founded in 1862. In recent weeks, laborers worked 24 hours a day at 30 Rockefeller Plaza to get the new store ready. Workers filled the nearly 2,000 square meter space with hundreds of stuffed animals: bears, elephants and more. The new store has the large clock that once occupied the entrance to the old store. And the building's second floor has a large piano keyboard. It looks just like the one on which Tom Hanks danced in the 1988 movie "Big." By the way, copies of the more than 6-meter-long instrument sell for $128. There is also a toy food-market, where children can shop among plastic fruit. For $75, another interactive play station shows children to care for baby dolls, while a "nurse" explains how to hold them. A 9-meter tall rocket is filled with stuffed bear astronauts. "We are all about experiences. That's what's different from other toy stores," said FAO's David Niggli. Other smaller, but temporary FAO stores are also opening for Christmas in England, Spain and Australia. A March opening is planned for a permanent store in Beijing. The company has announced plans for smaller stores in airports and other places across the U.S. and Canada. The business was started in 1862 by Frederick August Otto Schwarz, a German immigrant to the United States. He sold high-end toys, many imported from Europe. In the 20th century, the store became famous for selling pricey, high-end toys. The new store continues to sell such products, like a child-size, driveable Mercedes Benz. It sells for $25,000. But there are plenty of less costly toys, too. "I think that's part of what you come to FAO to see. It's part of the magic," said Niggli. His mom takes him to a toy store. The Central Park is not so well grassed as it used to be. The parent company retains more decision-making power. We must pull our company out of the financial crisis as soon as possible. 5.Now, FAO Schwarz is pulling back from the worst financial crisis since it was founded in 1862. We're not pulling back from our fundamental strategy, he said. But pulling back from the brink with the US is not enough. 6.By the way, copies of the more than 6-meter-long instrument sell for $128. By the way, how did your seminar go? By the way, I'm your number-one fan.